echotoall: Market Thought... a bullish recession? ECRI has been projecting a recession since September 2011. Today I read an article that references them, and states the US is already in a recession. 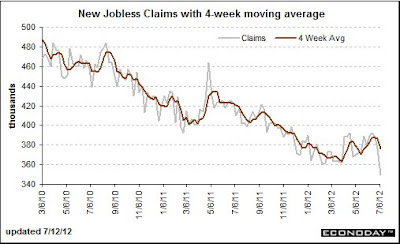 Over the past few months, the equities and treasury market have only cared about one number, US employment. Since April, the employment number has been crap, and we have seen some very significant multiple contraction across a wide range of equities. The treasury yield is also retesting its lows. The markets have endured a research shop that is widely respected on the street, severe multiple contractions across multiple sectors, along with enduring the rise in popularity of the end-of-the-world-folks. Yet through all this, the SP500 has maintained its trend. The equity market is still chewing on a +10year multiple compression. Yes, +10 years. Over the next few weeks, we will get our answer. First, we have earnings. Companies will give us the data points we need to confirm whether or not these multiple compressions were merited. Second, I will look to jobs. If the market acts negatively, or flat, but the above trend continues to go lower, I will to trade for a bullish Employment situation number.